Join us for our second annual fun run at the Royal Gorge Park Trails. We'll meet at Echo Canyon River Expeditions, where participants will board a bus and head to the starting line near the East Ridge Campground. We're offering two distances this year - a 5K or 5.55 Mile. Both are challenging, but both offer amazing views of the Sangre de Cristo mountains. While this run is NOT TIMED, you can vie for a crisp $20 bill - waiting for the first person in each age group (under 30, 30+, male / female) to snag it! Finishers will board a bus back to Echo Canyon, where your swag bag, complete with a coupon for $2 off a Colorado craft beer AND a snazzy commemorative cup. Why: Evening runs along some of the most scenic trails in the Royal Gorge Region? Yes, please. Which will you choose? 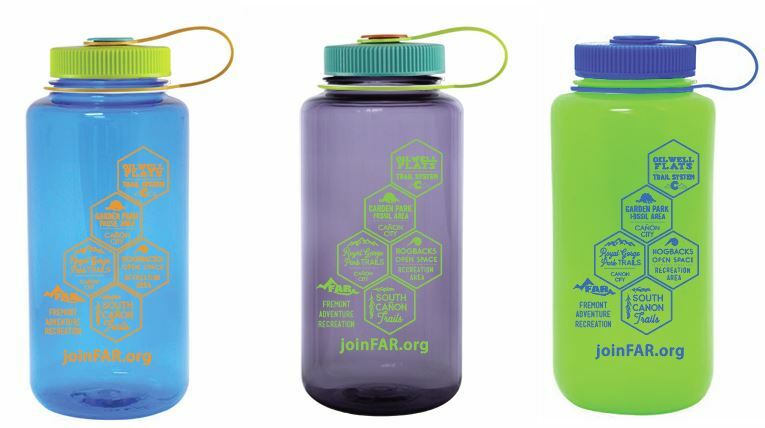 Each participant will receive a custom FAR Nalgene!